Jim Thompson, retired Frisco telegrapher, now lives in Springfield, Missouri, writes and collects railroad memorabilia. In 1844, Samuel F.B. Morse sent the first telegraph message from Baltimore to Washington, reading, ,"What hath God wrought." The dot and dash signals made from the sound of a clacking armature were easily read, and a new craft was born--telegraphy. The significance of this invention was soon forthcoming. In 1848, four years after the famous Morse message, news of the Mexican War was received by anxious North Americans within mere hours of the battles, not weeks later as in the past. The Thirty-Fifth Parallel Project (better known as The St. Louis-San Francisco Railway Company)and its accompanying telegraph line was begun in 1853. Already established from St. Louis to Springfield, Missouri, a telegraph line, and the "Old Wire Road," was extended from Springfield to Fayetteville. Arkansas, in 1859-1860. Then came the Civil War in which telegraphy played a strategic role. Commanders communicated with their troops almost instantly. After the war, not only railroads, but also telegraph lines had to be strung across a vast continent. The use of telegraphy advanced with the advancement of the railroad, because the telegrapher's primary duty was maintaining communication between the train dispatcher, who was usually many miles away, and trains and the whole rail system. He copied train orders and messages for the train crews and reported to the dispatcher the passing of trains. The telegrapher was the eyes and ears of the train dispatcher. There was some concern among telegraphers in 1876 when Alexander Graham Bell invented the telephone. Telegraphers watched the progress of the telephone with anxiety. They had controlled rapid communications for more than thirty years, and they saw this new invention as a threat to their future. After ten years of watching this creeping menace, one man decided to do something about it. On June 9, 1886, Ambrose D. Thursdon, the Agent-Telegrapher in La Porte City, Iowa, organized the telegraphers into a union on the Burlington, Cedar Rapids, and Northern Railroad (later to become the Rock Island Lines). The union was called The Order of Railroad Telegraphers. The first contract between Frisco and the Order of Railroad Telegraphers was signed January 1, 1906. The telegraphers didn't want to be required to teach telegraphy. They wanted the craft kept in the family of their children and relatives. The management, however, sent in young men of its choice to learn telegraphy from the experienced Agent-Telegraphers. The young men were told to go "cub" with the "old heads." After some long, tough bargaining, the Frisco agreed in the contract of July 1, 1910, that telegraphers would not be required to teach telegraphy. Despite telegraphers' efforts to prevent it, telegraph schools sprang up around the country, and the telegraphers lost control of teaching telegraphy. 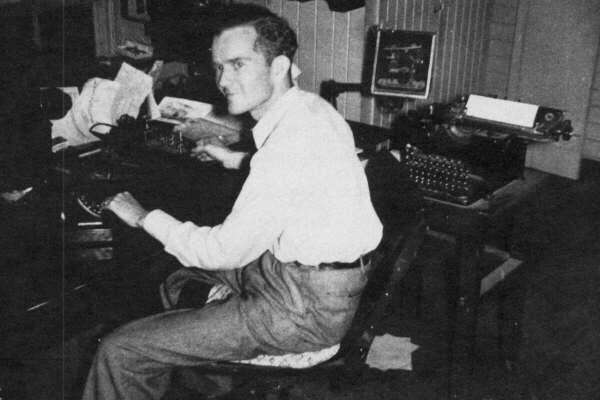 Jim Thompson at his telegraph desk, ca. 1948. In 1920, there were 78,134 telegraphers on all railroads represented by The Order of Railroad Telegraphers. Membership in the union had peaked. Twenty-six years later, in 1946, the Frisco had 5,000 miles of track and about 30,000 employees, including 5,000 telegraphers. Each small town along a rail line, about ten miles apart, had a depot. Most towns had an agent or agent-telegrapher. Some had a telegrapher on each shift around the clock. The typical small town depot, a long, grey, paint-peeling rectangle, paralleled the railroad tracks. At one end was the freight room, which had a pair of scales on wheels for weighing whatever needed to be shipped: dairy cream in heavy cans, crated animals, baled hides, furniture, machinery. At the other end was a waiting room for passengers, usually with a big pot-bellied, coal-burning stove for heat. Toilets, however, were outhouses, about 25 yards from the depot, with a quarter moon cut in the door. The depot office was located next to the passenger waiting room. In this office the telegrapher was also freight and passenger agent for the Frisco and agent for the Railway Express and The Western Union. He also handled the mail for the United States Post Office. In 1946, 102 years after telegraphy was invented, I walked into one of those Frisco depots to buy a train ticket and heard the clacking of a telegraph sounder. Because of my experience as a signalman and radio operator aboard ship in the U.S. Navy, I could read most of what I heard. In the Navy we used International Morse Code. Railroad telegraphers used the American version. I knew instantly I wanted to be a telegrapher for the St. Louis-San Francisco Railway company, the Frisco, the company with the coonskin logo. When that old Prince Albert tobacco can was placed in the resonator just right, the flat clicking of the sounder turned into music. That music made the work a pleasure to me. I was employed on March 27, 1946, and after a short training period was sent to relieve a telegrapher who was ill. The temporary office was a boxcar, without wheels, at the edge of a farmer's field, about ten feet from the track. The desk was made of rough sawed boards. The chair was a nail keg, the top padded with journal-box waste (a stringy cotton substance). A kerosene lamp furnished light. A clacking key and a telephone connected the telegrapher and the dispatcher. The telegraph key was for sending train-related reports. The telephone was for copying train orders from the train dispatcher. We had a six-day work week. My day off was Thursday. The Frisco was then in bankruptcy and in the hands of receivers. There was a shortage of everything. When we received a letter we turned the paper over and answered on the back. We used a pencil until it was so short we couldn't hold it; then we extended its life a little longer by pushing it into the end of an empty gun cartridge. Business began improving for the Frisco in 1947, when Clarke Hungerford became President. Many of our telegraph reports were sent to the Springfield Relay Office. That office always had the best Morse operators on the system. Clyde D. Rogers was one of the best. Clyde "Buck" Rogers, born June 26, 1909, in Ash Flat, Arkansas, established seniority on the Frisco when he went to work as third-trick telegrapher, 11 p.m. to 7 a.m. at Williford, Arkansas, on July 14, 1927. Buck Rogers is 85 years old, well, and living in Springfield, Missouri. I can remember only one time when Buck broke me. It was considered amateurish to "break" someone, that is, to interrupt another telegrapher's transmission. Clyde Rogers could copy Morse code as fast as I could send without ever breaking in, but one day he did. I had been sending a long train report to him for most of an hour when, to my surprise, he opened the wire and slowly sent five dots, ". .... " (the letter P). I waited for a few minutes. He came back on the wire and said, "Go ahead." I resumed sending. When I finished sending my reports, he receipted for them with the letter "X," nothing more, just the Clyde "Buck" Rogers signature: "X". Buck said he adopted the letter "X" as his sign because, using it, he could most easily record his sign, time, and date on messages with his left hand while continuing to send code with his right hand. He later became the Wire Chief over the Frisco System. He was also the General Secretary and Treasurer of System Division No. 32, The Order of Railroad Telegraphers. To me, Buck Rogers is Mr. Telegrapher. He "hired out" during the peak years of telegraphy. I came into the craft during the autumn of its life. We often played tricks on the wire with less expe rienced telegraphers. 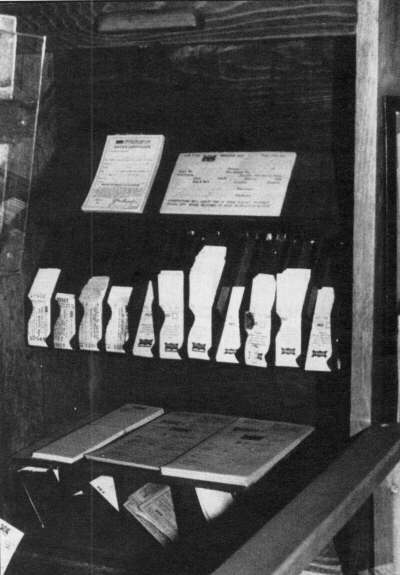 When sending a "consist" of a train, we followed a prescribed format: car initials, number, contents, where the car was from, and the destination and routing. For example, "SLSF 123456 Co Wheels St. Louis Springfield SLSF" meant Frisco car number 123456 carried a cargo of wheels and was bound for St. Louis via the Frisco line. When we had a "lid" (inexperienced operator) on the line, we had no mercy on him. When we sent the contents of the car, Co Wheels, we could pause after the "W" instead Of the "O", and he would write the contents as, "Cow Heels." It could not be erased because as many as seven copies were made with carbon paper. Lids either became good operators quickly, or dropped out. Experienced telegraphers had their own individual styles of sending Morse code, made by the ways they worked their keys. I knew one telegrapher at Memphis who sent like a loping mule. Another, who had a swing in his rhythm, we nicknamed Sammy Kay. Another who liked to send at 50 words per minute, but could only receive at 10, we called Flash Gordon. Telegraphy, like most technologies, underwent changes during its life. One of the greatest was in the telegraph key itself. The key was adequate for brief exchanges of information. Its sound also captured the imagination of news people and movie makers. But it was too slow for young, energetic telegraphers who had many long reports to send. They needed speed. The Vibroplex "Bug" machine was built for that. One could move more telegraphic traffic in an hour with a "bug" than one could in a day with a key. The train dispatcher issued a train order to the telegrapher at Amory addressed to southbound passenger train No. 1. He simultaneously issued an order to the telegrapher at Sulligent addressed to northbound freight train No. 322. No. 1 Engine 1000 meet No. 322 Eng 4005 at Quincy. No. 322 takes siding at Quincy. Passenger train No. 1 arrived first at Quincy, stopped, and held the main line. It was two o'clock in the morning. There was thunder, lightning, and rain. The engineer on steam engine No. 4005 caught his train order from the telegrapher at Sulligent and, using his railroad lantern, read his order on that swaying, jerking steam engine. Unfortunately, he read the meeting point as Amory instead of Quincy. Amory was five miles beyond the point where passenger train No. 1 was holding the main line. The freight train crashed into the passenger train at full speed. There were many casualties. Each telegrapher wanted to write legibly where his "Quincy" would not look like "Amory." The Frisco soon changed the name of Quincy to Fat, the initials of F.A. Thompson, an official on the railroad. Another of the changes in the telegrapher's work was the change from the train order hoop to the "Y" stick. From his trackside "bay-window" on the depot, the telegrapher watched for a train and the instant he saw it he told the dispatcher, who then decided if he wanted to issue a train order. If the dispatcher did, the telegrapher copied it, rolled up the order, clipped it onto the train order hoop, and raced to the very edge of the train platform, close enough the trainmen could grab their orders. He handed the first copy up to the engineer and the second to the conductor on the rear of the train. The train order hoop was intolerable. It looked like a big comma with an extra long tail. Moving aboard the train at great speed, the trainman ran his arm through the hoop, pulled it out of the hand of the telegrapher, took the order, and threw the hoop down alongside the track. Injuries occurred when the telegrapher was slow to let go of the hoop. Occasionally the telegrapher was jerked down on his back. Likewise, the trainman sometimes suffered arm injuries. The old train order hoop was replaced with the "Y" shaped train order stick. The telegrapher placed the order in a string and then threaded it around the stick. The telegrapher held the stick and the trainman took only the string with the order attached in a slip knot. Telegraphers at most small stations, in addition to their railroad duties, worked for Western Union. Sending, receiving, and delivering telegrams was engaging work. There was always a sense of urgency about a telegram. Many contained death notices or news of serious illness. Others announced births, anniversary wishes, or congratulations on a job well done. Those brought smiles, and tips, from the recipients. The railroad would not permit gratuities, but Western Union had no such rule. I had only one bad experience with Western Union. On a temporary assignment, I was busy with office chores, but I heard someone on the telegraph frantically calling, "CND, "CND", "CND." My friend, C.N. Deckard, worked at the next station south and I wondered why he didn't answer the wire. I thought one of his friends was calling him. It wasn't uncommon, when you wanted to talk to a friend on the wire, to just use his initials instead of his station call sign. Soon the telephone rang and I answered, "Hello!" It was the Western Union Wire Chief. His voice was several octaves above normal, and he asked an insulting question, "Can you telegraph?" I answered, "Yes, sir." "Then why in the blankety blank blank don't you copy this Commercial News Dispatch I have been trying to give you for the last ten minutes?" "CND?" I asked. I told him I thought he was trying to call my friend C.N. Deckard; he wasn't impressed. The regular agent had failed to inform me that a Western Union customer at the station subscribed to a futures report on pork-bellies through Western Union. From that day forward I forgot about my friend Carl N. Deckard and concentrated on pork-bellies. Western Union paid 10% commission for handling their business. Telegraphers at many small stations were also agents for the Railway Express Company. Commissions from Western Union and Railway Express combined with wages from the railroad made a good job in 1946, and we made every effort to protect our incomes, sometimes inventive efforts. A friend of mine told me this story. A dog breeder shipped many prize-winning dogs from his station by Railway Express. One day he brought in a registered hunting dog with a long pedigree for shipment. The express train had already left for that day. This meant the dog would have to be fed, watered, and exercised. My friend went into the freight room at the proper time and opened the dog's crate. He said the dog jumped out of that crate like a crazed wild animal, bolted out the door and down the street, with my friend in hot pursuit. However, the dog rounded a corner and disappeared under a fence. My friend sat down on the street curb, winded, tired, and angry at the dog. He wondered what he would tell his superiors. He said he looked up the street and there he saw an ugly, skinny, stray dog standing on his hind legs looking over into a garbage can. My friend said he slipped up behind that dog and put his belt around his neck. He dragged the dog back to the freight room, fed him, watered him, and shipped him out on the next express. My friend said he heard nothing more about the matter. He did, however, collect the commission on the shipment. 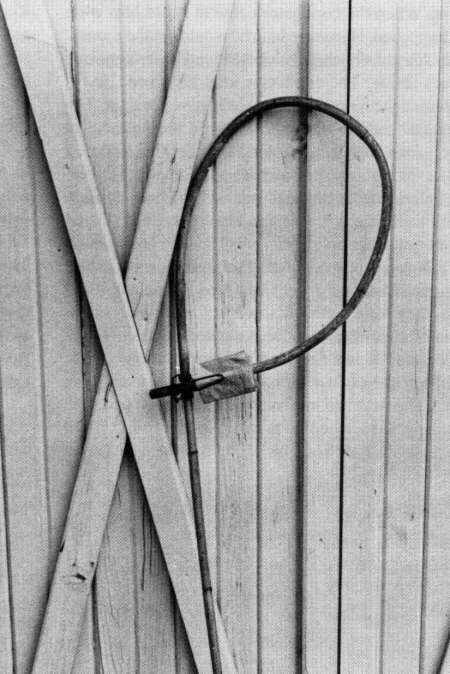 Train order hoop, used to communicate with moving trains. Ticket sales to passenger-train customers was also part of the te!egrapher's work. Extreme care had to be taken when figuring the cost of a ticket. Any shortages in money came out of the telegrapher's check. Passenger train business was good during and immediately following World War II. The waiting room was full when I opened the ticket window. A smiling customer with a friendly voice stepped up to the ticket window and laid a fifty dollar bill on the ticket counter. He then held it up to make sure I saw what it was. I had not seen many fifty dollar bills. We exchanged pleasantries and he told me where he wanted to go. I turned my back to him and pulled the ticket out of the ticket case, stamped it, and laid it on the counter. I said, "That will be nine dollars." I took his money, put it in the money box, and gave him forty-one dollars in change. The next customer bought a ticket and gave me the money. When I opened the money box to deposit her money, there in the big bill tray, instead of a fifty dollar bill, was a five dollar bill. I looked under the five dollar bill, but there was no fifty. I felt first class panic, since that represented almost a week's pay at that time. I was so horrified I couldn't calculate how much money I'd lost. I gave him a nine dollar ticket. He gave me a five dollar bill. I had given him forty-one dollars in change for a fifty dollar bill that I had only seen, but not received. I sold tickets to the rest of the customers and waited for the train to arrive. When the conductor came in I told him what had happened. He assured me he would get the money. A few days later an envelope arrived with forty-one dollars inside. The conductor kept his word. He repossessed the money I erroneously gave the thief. The scoundrel rode to his destination on the nine dollar ticket, for which he only paid five dollars. Today, I still have trouble with this math problem, but I think I lost four dollars in the deal. It must have been confusing to everyone because the Frisco never deducted the money from my check. Telegraphers worked on a seniority basis, first in, first out. Until they were assigned permanent positions, they were on the "Extra List," working relief in cases of sickness, vacation, or emergencies. Working "extra," I have arrived at small stations in the middle of the night with no place to sleep except the depot. The ticket counter made a pretty good bed. The company subscribed to a book called the Official Guide. It was four to six inches thick and made a good pillow. If the weather was cool I'd build a fire in the big pot-bellied stove in the office. If I could find a tin can and some water, and if there was a store nearby, I bought some coffee and boiled it on the stove. Most stores sold cheese and crackers, sausage, and sardines. With that and a little fresh fruit, one could prepare a fairly good meal. Telegraphers were assigned positions according to seniority. The senior telegrapher was almost always entitled to the position. On one occasion I had been deeply engrossed in what I was doing and then realized there was someone standing behind me peeping over my shoulder. It was Eddy Reeve. He had the seniority roster in one hand and was trying to read my name on the Passing Train Report, which we had to complete at the start of each shift. My name appeared at the top of the report. He was looking for a place to displace and he wanted to know if he was the senior employee. He was--and I was immediately displaced. I, in turn, displaced someone else, and the bumping continued until someone became unemployed. Finally, I was assigned to a regular position. I was senior bidder. I had grown tired of traveling and was ready to settle down. My wife and I finished our extra assignment and headed for our new home. The passenger train on which we were riding stopped at my headquarters for a few minutes. I got off the train and went into the office. The chief dispatcher, W.M. Robuck, said, "Jim, you have been bumped by a senior employee, but I want to send you on another extra assignment." What! We were disappointed to say the least. However, after a time I was assigned to a permanent position, which I was able to hold until I retired. The complimentary close following a transaction on the wire was '"73," a symbol of fraternity. In 1967 a final '73 was transmitted across the Frisco system, and with that, telegraphy was discontinued on the Frisco, 123 years after Samual Morse's 1844 message. Through the 1950's and 1960's, technological innovations in radio, telephone, and computer combined to make Morse's message seem overly dramatic. But to those of us who were the eyes and ears of the railroads, we were, like Mercury, messengers for thundering giants. All photos by the author, courtesy Frisco Railroad Museum, Springfield, Missouri.